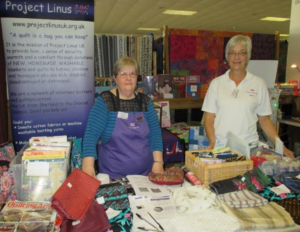 Heather Russell and Helen Scales manned the Project Linus stand at the Quilt and Stitch show at Uttoxeter. We would like to thank everyone who supported Project Linus through the purchase of fabric, books, magazines and raffles tickets. We look forward to seeing you at the Festival of Quilts in August. 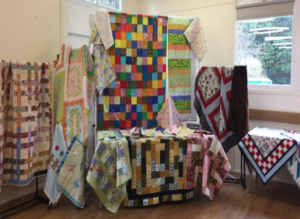 I collected 18 beautiful quilts & gave a talk about Project Linus in Norfolk to the lovely group at Leziate Village Hall. They were made from the fabric donated to them by a husband of a late member. I collected another 12 quilts from a regular donator, Freda and her friend Ann at the same event. The quilts have been given to a local hospital and Nelson’s Journey, a charity that supports children bereaved in Norfolk. Thank you ladies for your support, it’s greatly appreciated. 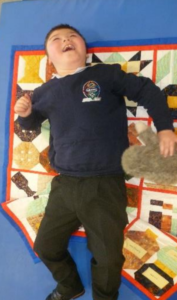 We recently donated quilts to Foxfield School, Wirral for children with special needs. The photos show some of the pupils with the quilts which they were very pleased with and the lovely thank you gift they sent in return. QGBI Region 2 organised a Block Party in Surrey recently. I was able to take along all my donated UFO’s and many sets of pre-cut squares. We had 15 happy sewers for the day, and ended up with 17 finished tops, which then were kindly taken to be long arm quilted. I’m really looking forward to getting them back! I was also asked to represent Project Linus at the Knitting and Stitching Show last week at Olympia. The Quilters Guild had a free drop-in workshop running for the whole show, with 6 sewing machines with tutors, and hand piecing too. The aim was to encourage people to have a go at making a block. 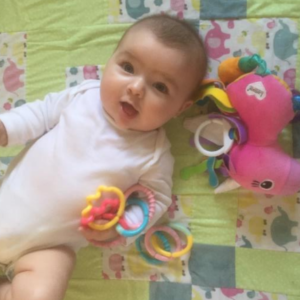 The blocks were then all donated to Project Linus. Over the 4 days 591 ‘Corner in the Cabin’ blocks were made which are now being made into quilts. We were also able to introduce many people to the Project. It was very satisfying to meet people who had never attempted any patchwork, then proudly putting their finished blocks on to the design wall. It was also great to meet other co-ordinators, and many supporters over the four days. I arrived home on Sunday night completely exhausted but very happy! Many thanks to the Quilters Guild for their great support for our organisation. 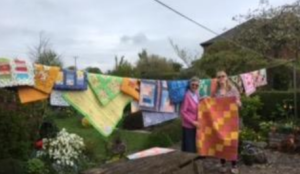 This is a photo sent by Mary Wood, coordinator for Herefordshire, picturing her with her daughter Gill from York, also a patchwork enthusiast, when Mary went to receive the magnificent total of thirty quilts from patchwork teacher Ann Jermey. Meeting at Doughty’s Warehouse in Hereford, Ann told Mary that she and a friend Chris had completed the quilts using fabrics and blocks kindly donated by some of her friends and students. Given the number of quilts made, this must have taken quite some time. Mary was particularly grateful to receive them at this time as she had just delivered the last of her collection for the use of the children from the latest group of refugees from Syria who will live in Hereford. Apparently, they have settled well and were delighted with their gifts.